If an artist is not necessarily someone who is lonely, starving and unstable, then what does an artist look like? Can an artist actually live in abundance? Mark Twain said "If you want love and abundance in your life, give it away." And that is what I see many artists doing every day. The new portrait of a profitable, successful artist includes creating and showing, but also travel, community, licensing, teaching, authoring, curating, serving and changing the world. And this is one such case. 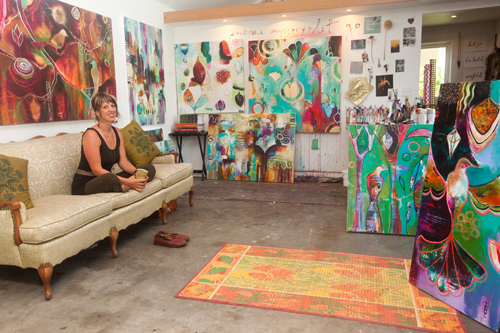 Flora Bowley's story is a beautiful example of full, unapologetic knowing that life unfolds and abundance follows when you follow your heart. Her resume is a wandering series of bold experiences dotted by various careers and heartfelt passions. She now realizes that this way of moving through the world is a clear reflection of how she creates her intricate, mesmerizing paintings. In this way, her life and artistic process are one. Flora says she was born knowing that doing what she loves is more important than wealth. She took breaks from college to snowboard, work as a massage therapist and as a yoga instructor, all while honing her style as a painter. For many years, Flora also traveled the world on a shoestring living in tents, warehouses and sleeping on the beach. It comes as no surprise then that all those experiences led to incredible possibilities and lifelong connections. After Hurricane Katrina, Flora got a ride to New Orleans despite not being with an official organization. She ended up spending 5 months there where she co-founded Emergency Communities, a non-profit organization that ran a soup kitchen in the disaster zone. At the end of her time there, Flora was prompted by a local gallery to paint a show. She accepted the challenge and painted about 20 pieces in the 3rd floor of a flood-damaged house. The work was loved and the sales of these paintings provided the boost she needed to start her life in Portland, Oregon. Flora has tapped into a thriving artistic community since her move to Portland. Opportunities for collaboration have been plenty. She once told me that the amount of creative happenings are sometimes overwhelming and that she must be selective if she wants to ever get her own work done. But Flora has certainly participated in her fair share of them as well. Just a few months ago she painted a collaborative piece on stage with a fellow artist as midnight and 2013 approached the city. Everything that has grown from her passion and experience is a beautiful testament to the rewards of hard work, valuing community and the power of a creative mind. Flora has now written a book, is represented by several galleries, licenses her art, regularly does live event painting, curates large artist shows, teaches in Bali, Mexico and Australia and offers an online course to thousands of students all over the world. Sharing her process of painting has been a conscious choice for Flora that has resulted in the most abundance of all. Flora doesn't believe that artists benefit from holding their processes close. She believes that artists benefit from opening the door for others to also discover the life-changing experience of the creative process, and what Flora teaches is much more than just painting. Flora's online class, called Bloom True, prompts people to ask: "Where can you be more brave, more intuitive, more authentic and more playful in your life and in your art?" Through video and written content, students are guided through 5 weeks of heartfelt instruction and prompts. Throughout the course, students create their own large colorful paintings, but they also make connections and form intimate new friendships through private Facebook groups that live on well past the class's end. The online class was created in collaboration with Beth Nicholls of Do What You Love. Flora's online class is one of a few that Beth and her team have orchestrated. DWYL is dedicated to producing tools and inspiration for people seeking to live the life they crave. Working with the best in the business, DWYL manages the technology, customer Q&A and pulls out the best the teacher has to offer, making it possible for the artists to do what they do best. I love the idea of painting for the sake of painting and the joy it brings. So many people get this idea that they are not artists, but I believe all humans are all born with the capacity to create. It's about moving through the stories we have about we we can and cannot do, tuning into our intuition, being brave and following our hearts. So, if you have a desire to paint, connect or live more bravely, let Flora's art and teaching inspire you to step more fully onto your creative path. Her next five-week online course begins on May 27, 2013.